Highlighting the latest developments in the logistics and supply chain industry on CNBC. "The protocol will bring the industry much needed cooperation by providing consensus on the rules, behaviors, and formats of communication in the ecosystem..."
Advancements with Ted Danson will focus on how smart contracts are being used to create efficiency throughout the supply chain ecosystem. This episode is scheduled to broadcast 4th QTR, 2018. Check your local listings for more information. The logistics and supply chain industry has benefitted from embracing innovation and technology throughout its history. Inefficiencies stem from poor coordination, outmoded processes, redundant paperwork, and myriad manual transactions. 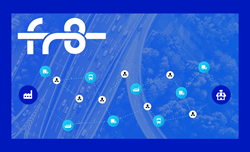 This segment of Advancements will take a look at how the Fr8 Network is building the rules, standard, and formats for communication in logistics. Ultimately providing greater visibility into shipments, an immutable record of the regulatory requirements, and expedient settlement for all parties. With the foundations established in the Fr8 Protocol, applications can be built that conform the agreed global standards. These applications, deployed on the blockchain-backed infrastructure of the protocol, will connect carriers, suppliers, brokers, and the rest of the logistics industry around a shared resource. Fr8 Network is a single source of truth for blockchain enabled logistics. We’re building the efficiency layer and developing the standards protocol behind it to solve today's challenges and power the future of supply chain. Consisting by experts in shipping, blockchain, and engineering, the team at Fr8 Network is laying the groundwork for improvements in efficiency, transparency, and reconciliation in logistics. For more information, visit: http://www.fr8.network. Backed by experts in various fields, and a team dedicated to education and advancement, DMG Productions consistently produces commercial-free, educational programming on which both viewers and networks depend. For more info, please visit: AdvancementsTV.com.